Of course it’s about the team, but you know what helps the team win? Goals and assists. And regardless of their motivation, hockey players want their contributions to success to be tracked forevermore in the annals of hockey history. But we all know there’s a lot more going on with each goal and assist, and sometimes contributions to the offense aren’t tracked by traditional data points. Enter advanced analytics: from corsi to PDO to defended zone entries, analytics in hockey are finally catching up with baseball and other sports that track the details that contribute to success on the field. Want to teach your players about the value they can bring to the team even if they don’t score all the goals? So what is it? Fenwick is unblocked shot attempts for vs. unblocked shot attempts against when a player is on the ice. Whereas corsi awards points for any shot, fenwick punishes shots that are blocked. A shot can still miss the net, but it can’t get blocked. And the other team? You guessed it, they’d all be -3. If the opponent manages a single unblocked shot attempt, then they’d be up to -2. Fenwick encourages teamwork. If a player makes a pass to a defenseman who then gets a shot through from the point that just misses the net, both players get rewarded. 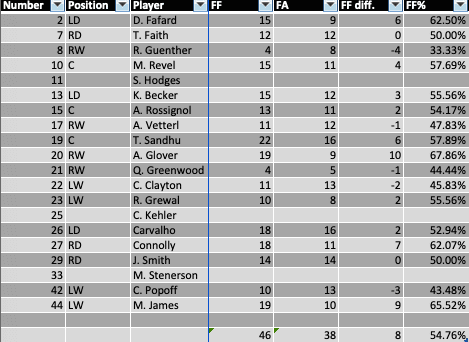 So if you’re looking for an in-depth measuring stick for your team in the second half, and you’ve got a willing parent or volunteer, have them fire up the ol’ laptop excel machine and get counting. 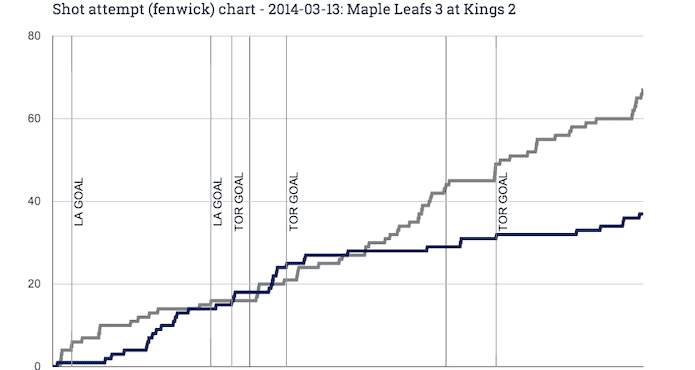 Here’s what a typical fenwick chart for one game looks like. Pretty good night!